Famous quotations for Valentine's Day. 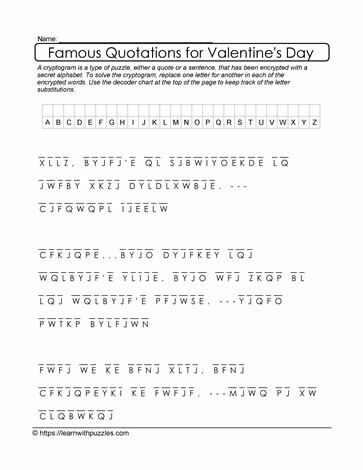 Here is a challenging famous quotations for Valentine's Day downloadable puzzle to activate students' problem solving strategies and vocabulary building skills. Three cryptogram quotes are from a different famous person. The author's name is included at the end of each quote. Solutions to the puzzle are completed by deciphering the alphabet code. Then record each letter substitutions in the table provided. Use in regular, digital, Google and homeschooling grades 9-12 classrooms. Differentiated instruction can be included to access earlier grades.